A little nerdy bundle of crazy fun with way too many books in my TBR pile to be buying more. That hasn't stopped me before, though. Overall, it was dark, entertaining, and really insightful in terms of the story of the Pied Piper. I loved the duality of the two brothers, and their relationship progress as the book goes on and as they age. Also, many other well-known fairy tales are included as accents to the central story of the two brothers, which was really entertaining and insightful. I enjoyed it, mainly because it was nice to see a different format to Willingham's graphic novels. That being said, I do think that he is better off at writing the graphic novel versions of Fables. The book reads a bit choppy, to be honest, but the characters, their development, and the storyline as a whole were fully fleshed out. 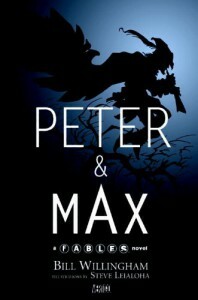 I also don't recommend reading this before reading any of the Fables graphic novels, because you will be very lost in terms of a few aspects of the overall Fables storyline. The book CAN be read apart from the series, but I strongly suggest reading it after just so you understand the context of the Fables world.